Are you at Boracay for Labor Day Weekend? 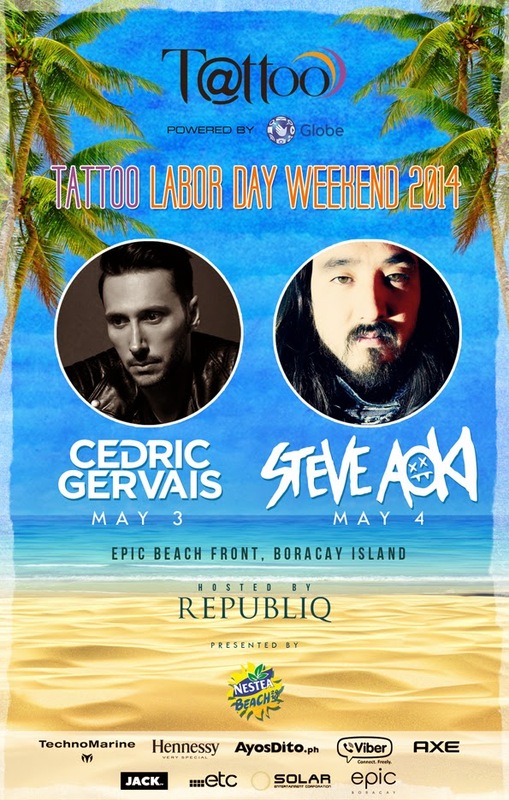 Brought to you by Globe Tattoo and hosted by Republiq, catch psychedelic beats spin-master Cedric Gervais on May 3 and Grammy-nominated producer and DJ, Steve Aoki on May 4 at EPIC Beach Front, Boracay!!! Typing this is making me sooo jealous. So regretting my lola decision-making process. Wish I sucked it in and went #Laboracay as well. Anyway, if you're there (lucky you.) make sure not to miss this awesome EDM partay. 3 tickets when you avail of a Tattoo Postpaid tablet offers with a free Mobile WiFi! To top it all off, take your Tattoo Labor Day weekend experience further and create and share your Boracay party playlist with GoSURF and Spotify! GoSURF is the brand’s new consumable mobile internet data plan. Register to GoSURF50 for only P50 with 250MB of data for 3 days and free access to 30 Million songs on Spotify! You even get 1 more additional ticket to the event with your subscription!